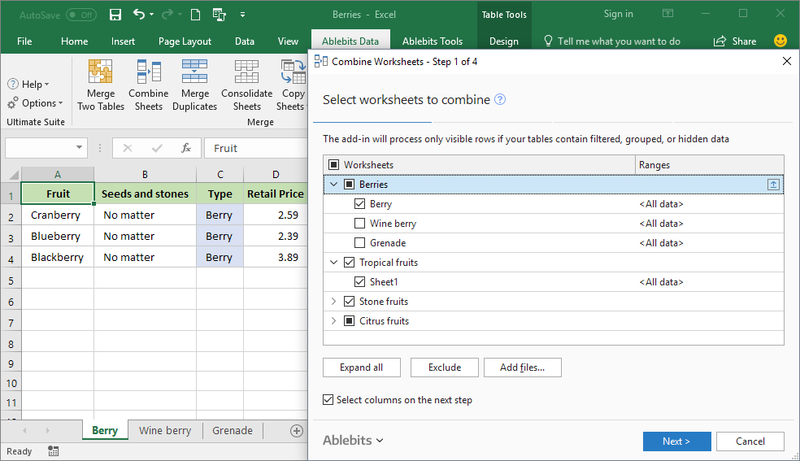 Use the Combine Sheets Wizard to merge data from several worksheets into a single Excel sheet based on column headers. You can choose what columns to copy, whether to move the original formulas or calculated values, and how the resulting sheet should be formatted. Have the results inserted in the same or new workbook. 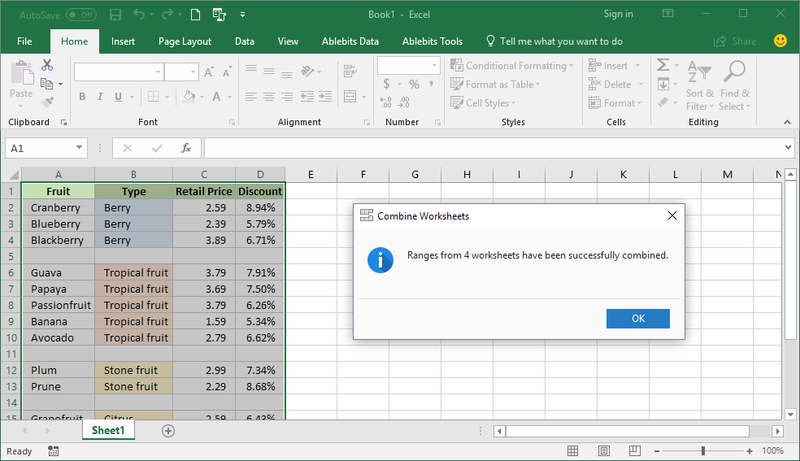 Combine as many sheets as you want Use the tool to quickly merge an unlimited number of Excel worksheets in one go. Merge sheets by column names Bring the data from identically named columns together, no matter the column order. Save all formulas and formatting Transfer not only formulas or values to a new table, but the original formatting as well. Create links to source data Get the results updated automatically when the data in the original tables changes. Separate copied ranges by blank rows Add a blank row after each subset of data to make the results better readable. 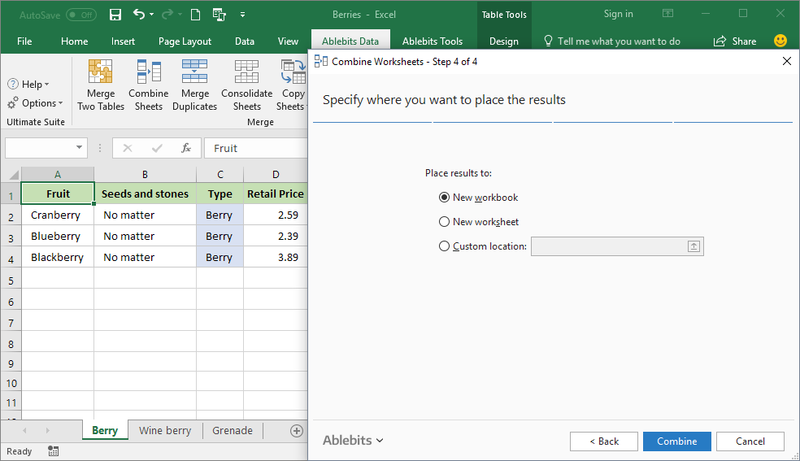 Have the results wherever you want Put the merged tables into a new workbook or worksheet, or choose a location on your current Excel file. This tool comes in handy when you need to merge data from many worksheets and workbooks together. 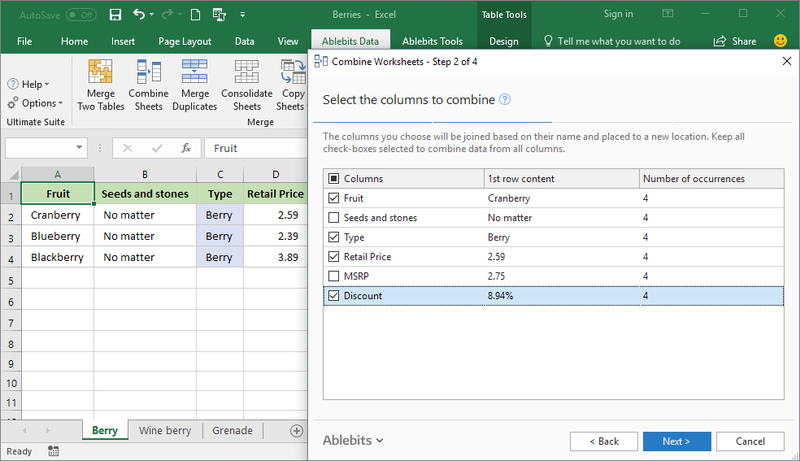 The add-in combines multiple Excel sheets into a single table according to their column headers, no matter the column number or order. Their original formatting and formulas can be copied as well, or you can link the combined datasets to their sources. Doesn't Excel provide a way to combine sheets? You can get it done by copying and pasting your data manually or with VBA. 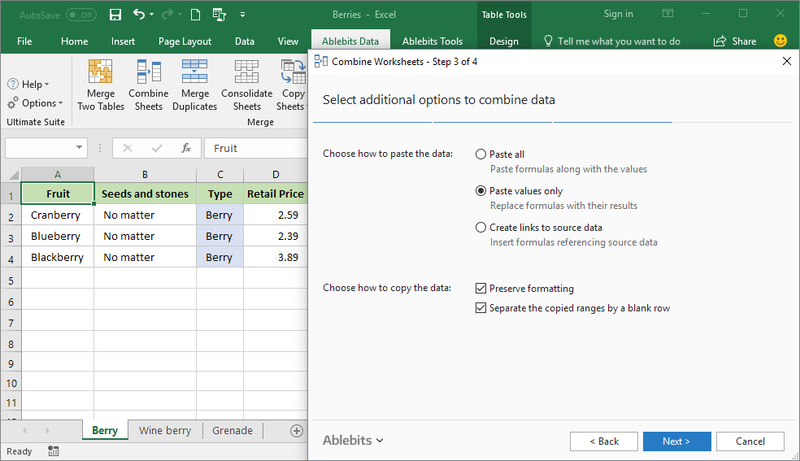 Or, use our Combine Sheets tools for quick and easy merging. How to merge multiple Excel files at once? Click Combine Sheets on the Ablebits Data tab. Select additional options to merge data. Lastly, specify where you want to place the result. Columns in my tables change places from file to file, how will your add-in manage them? 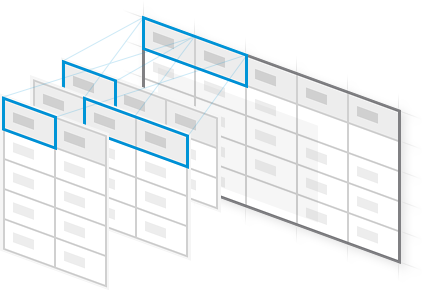 Combine Sheets recognizes the identically named columns and merges their values into one column, regardless of the position of the columns in the source tables. My data includes many formulas, will your add-in transfer them as well? Yes. You can choose to copy the formulas or their calculated values, or even create links to the source data, so the combined table will update automatically with every change you make to the original sheets. My tables are formatted differently, can the add-in keep my formatting? Yes. If you choose the Preserve formatting option, each table will be copied with its own formatting.